- The tag on that photo reads "Old Tanzawa". Google search came up with the Tanzawa Mountains in Japan. Hmmm...maybe this is a future time when Godzilla's radiation has affected Japan, and the survivors are either trying to destroy Godzilla or find a way to return back to their homes? This would indeed be very interesting, in fact the whole possible premise gives a new face to the franchise that already seems worn. So as Blame !, the movie will come via Netflix, maybe it will leave in the theater also as will happen with Blame !. Ps: great image, it's been a while since we have a good science fiction anime. 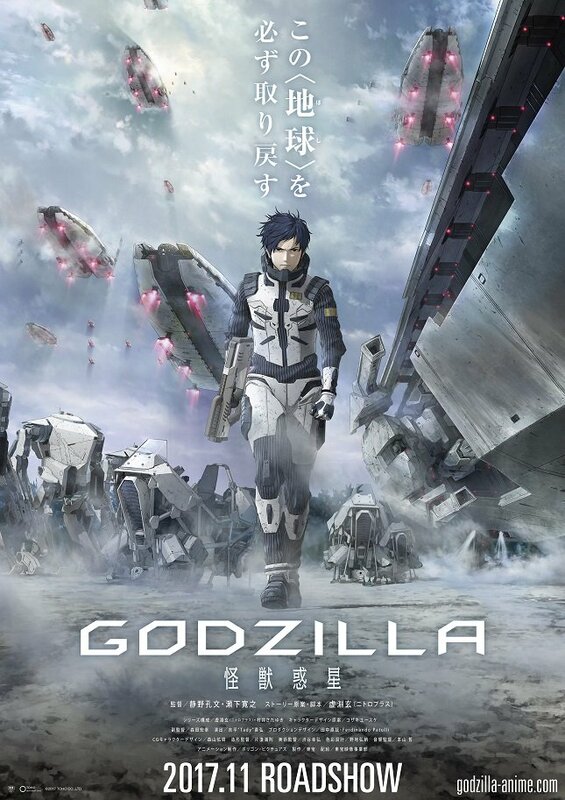 The full title is Godzilla: Kaijū Wakusei (Godzilla: Monster Planet). The tagline on the above poster reads "We will definitely take back this 'Planet'." 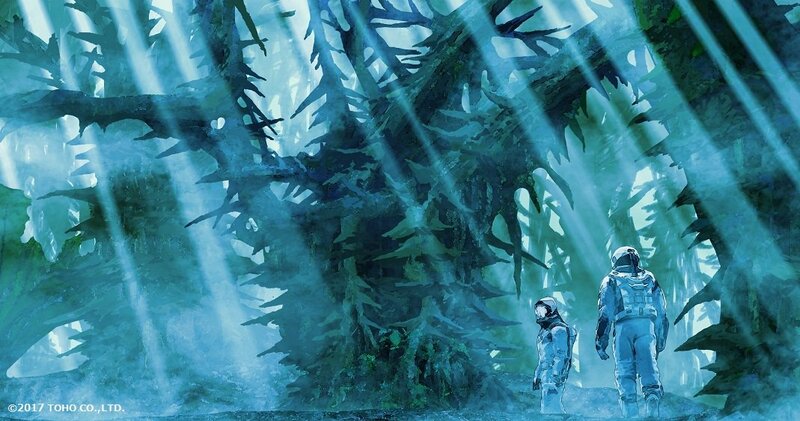 The film takes place 20,000 years in the future on Earth, where Godzilla is at the top of the ecosystem, and humans fight to take back the planet. On Earth, kaijū suddenly appear, and the "ultimate being" of Godzilla rises to exterminate them. After half a century of war between Godzilla and the kaijū, humanity devises a plan to escape the planet. A group of humans chosen by AI board a spaceship called Aratram to travel 11.9 light years to immigrate to a new planet, Tau Ceti e, which rotates around the star Tau Ceti in the constellation Cetus. After traveling for 20 years, the ship barely makes it to the new planet, only to find that it can't support human life. The protagonist is Haleo (pictured above), who saw Godzilla kill his parents before his eyes when he was four years old. During the 20-year voyage, he has thought only of going back to Earth and killing Godzilla to avenge his parents. He joins a team that will conduct a dangerous trip through hyperspace to return to Earth. However, when they arrive, they find that 20,000 years have passed on Earth, and the world they once knew has completely changed. Last edited by LG-MAX 2.o; 2017-03-24 at 06:28. The summary sounds interesting. I'm definitely watching it now. it's sounds interesting. probably worth the wait. That sounds very different from regular Godzilla films, at least the ones I've seen. I'm very interested now. I think it kinda takes the franchise out of its comfort zone. Kinda reminds me of that cartoon series where they put ancient Sherlock Holmes in futuristic UK. Then again, that's what Urobuchi like to do, so yeah, I'm on board. Kinda reminds me of that cartoon series where they put ancient Sherlock Holmes in futuristic UK. 1. "BraveStarr" Sherlock Holmes in the 23rd century. This was an episode of the BRAVESTARR TV show that I used to watch as a kid and recall fondly. 2. Sherlock Holmes in the 22nd century. This was the very first time that I heard about this show; didn't know it exist until I research on it. Sherlock 22nd Century is actually pretty amusing. We got RoboWatson & a hot female Lestrade along with Sherlock who needs some getting used to on how things work in the future . Well ... the setting of the new Godzilla movie will certainly be ... different. not sure they will reuse that unused concept of Shin Gojira evolving into a glowing Adam-like humanoid after its 'skin' peels off. The anime is going to be a film trilogy. As a lifelong Godzilla fan I'm extraordinarily excited for this. I've always wanted a Godzilla anime, and I'm so glad they've gone with a premise that takes advantage of the medium. Something like this simply couldn't be done well in a live action TOHO movie. Also, love how of a hard sci-fi plot the film has. There's always been sci-fi in Godzilla of course, but it's always been done in a pretty cheesy, campy sort of way so this is a wonderful change. And yeah glad to hear it's getting three films because the plot doesn't sound like something that could be done justice in just one movie. A trilogy. Okay now that sounds promising. This looks Luke what happened to Ajin, maybe this will turn a TV anime. Turns out Miyano Mamoru plays the main character, and now I'm less excited. :/ I wish it was Kaji, or literally anyone else from the cast... Sure, Miyano is popular and will bring in viewers, but he has a tendency to be only good with roles that fit him, and this certainly doesn't seem like such a role. The real tragedy here is that the MC bears an uncanny resemblance to Kaji, yet not voiced by him even though he's in the cast. Panel taken from here (NSFW-ish). Translation/type by some /a/non. Heh, HanaKana playing the female lead AND the character is the MC's childhood friend? I don't care about anything else. A Godzilla animated movie? Now, this looks interesting.